Nestling in stunning scenery Another World is just that, worlds away from the office. Our activities are numerous and diverse some in the woods, some in the cabin, others on the floor, some in the air, some make you move, others will make you think, some will make you scratch your head, some will make you want to pull your hair out…but just about all will make you smile and laugh and ALL will bring your group together -we hope your team will be talking and laughing about their day for months to come. 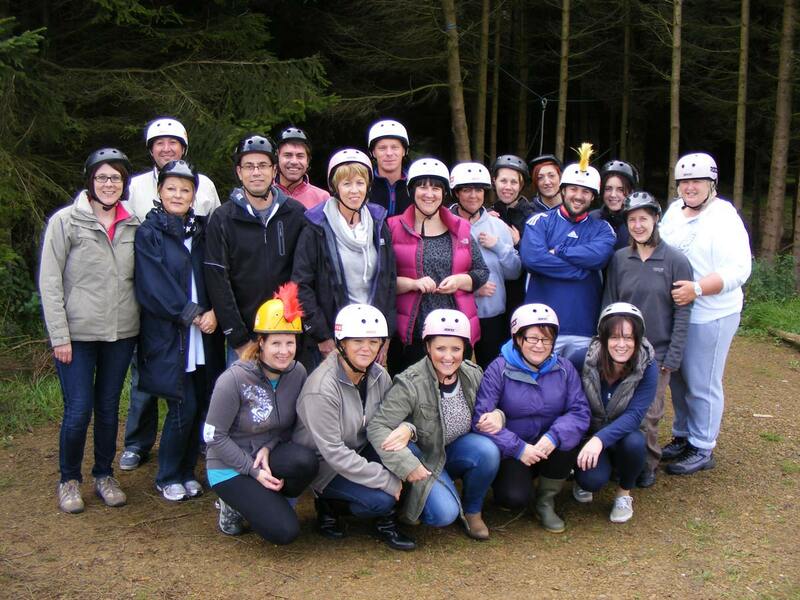 Our activities are designed to help your team communicate and listen to each other, interact and work with each other, laugh with (and probably at) each other and ultimately enjoy their time together. For photos and videos please take a look at the facebook page – https://www.facebook.com/AnotherWorldAdventureCentre/ and click on photos or videos from the list on the left. Our central hub which is our log cabin needs to be seen, it has a well-stocked bar, PA, DJ and Karaoke (for later events), a big screen and projector so it can also be used for meetings as well as a social event or even a full-on party. We have outdoor, woodland and a huge heated marquee area where we can hold our activities, so the weather can do its worst, it also means we host events throughout the year right up to our Christmas parties from the end of November till late December. Many of our activities are quite unique and unusual – (we like to be bit different), they all have their own designated areas at our centre and most are purpose built and checked for safety on a regular basis. We can run our events at any time – day or evening, during the week larger groups would have the exclusive use of the centre and smaller groups would always have the activity and the cabin to themselves but there may be other people at the centre. We run our events very much as a social event, we have a very relaxed atmosphere and build the day as you want it, that said, we take our safety very seriously and whilst being up for a laugh and just a bit mad our instructors are professional and qualified. We offer different food options from a welcome breakfast to a BBQ buffet – we cater for most dietary requirements including vegetarian & vegan, halal and gluten free. Our activities are all on one site in the hills of Halifax West Yorkshire, 20 minutes from the M62 corridor so within easy access of most northern Towns and Cities. Archery – Target or woodland or a combination of the two. Mountainboarding, grass sledging and dirt scooters. Go kart building and racing . Target archery, 9 hole archery golf, target sling shots with paintballs. Target Air Rifles & Pistols. We can offer Catering during or after your event and can cater for any special dietary needs. Why not take advantage of our legendary Barbecue based lunches starting at £9.00 per head through to our BBQ buffet banquet at £16.00 per head. We can also offer the option of a hog roast for a minimum of 50 people ( see our catering page for more information).